I was abit nervous as didn't know what to expect but as it was local I thought I'd give it a go. The manager who cut my hair was very friendly & soon put me at ease as the consultation prior to the cut was thorough. She cut & styled my hair exactly how I wanted it & I left a very content customer. I would definately go back again & would recommend a visit. 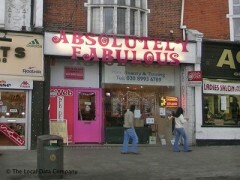 I called Absolutely fabulous on the day i wanted an appointment and i was lucky enough to get one. They were very friendly and welcoming upon my arrival. The stylist was very understanding and listened to my requests. She continued to check with me throughout my appointment and seeing if i was happy with the cut and the amount being taken off. I was very happy with my cut and would definitely return. Great prices too!